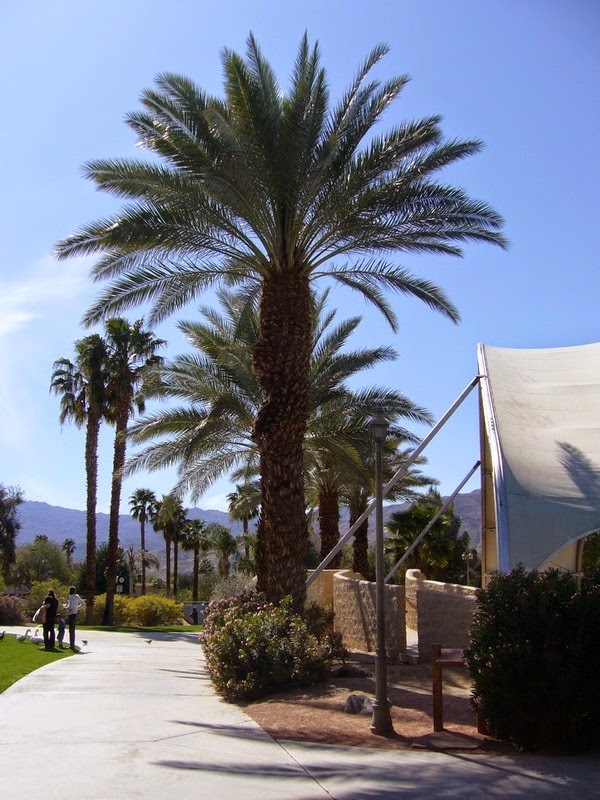 Recently I was waxing horticultural to Philip, telling him all about the delights of palms and how to distinguish the different types. He was looking glazed as I droned on in lecture mode. 'Leaves or fronds, as are they are often called, are either fan or feather leaved and a few with ragged leaf ends are described as fish tailed. And this simple descriptions help with identification - of course - that's what fronds are for, I explained!' I couldn't resist that. 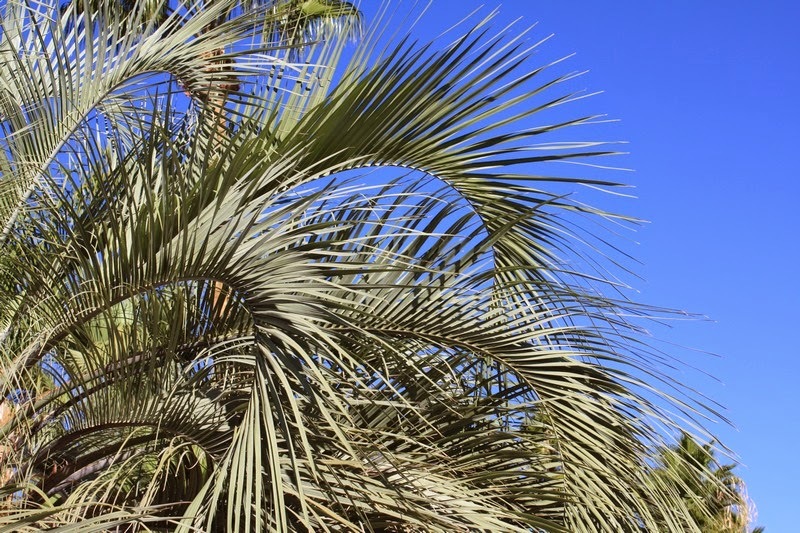 After writing entries for this blog for nearly two years, although I have written about pampas, I've never written about palms. What an omission! 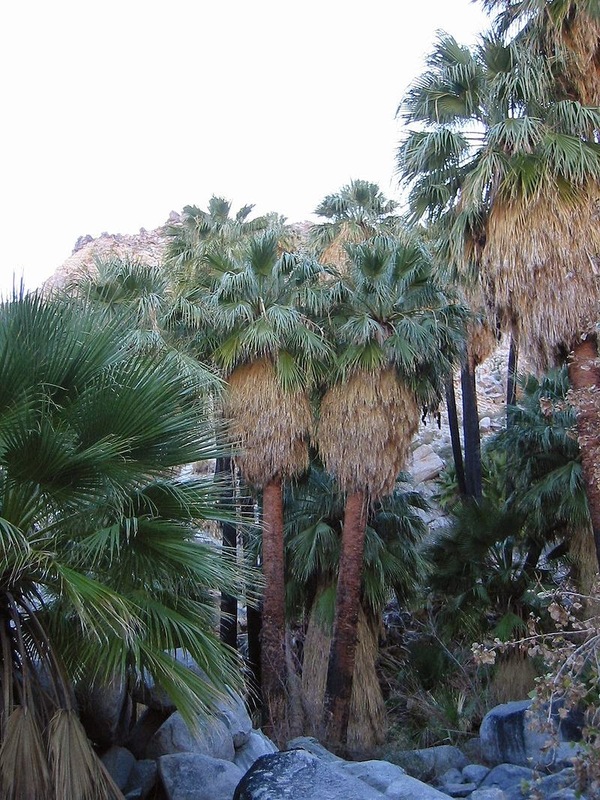 I guess subconsciously I've been avoiding this, as I really don't know much about palms despite living in a city called Palm Springs! My recent trip down to Florida enable me to get several new pictures of palms, some of which I couldn't identify and this set me thinking about this huge group of dramatic trees. 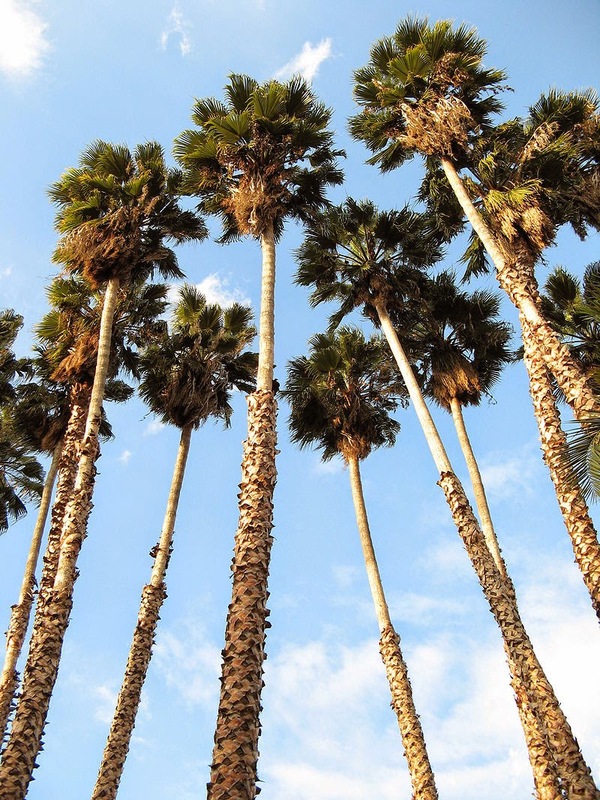 The family may be called Arecaceae or Palmaceae and there are 200 genera with 2600 species - not exactly a minor group of plants, although with most being tropical, sub-tropical or warm temperate, us chilly British gardeners tend to forget them. 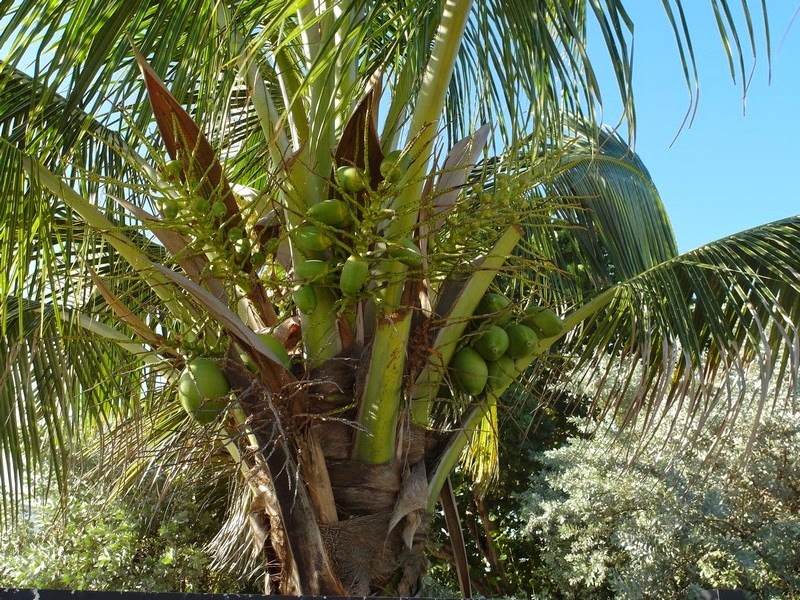 Commercially they are the sources of coconuts, dates, palm oil and even raffia. Commonly they are trees with a single trunk ending in a crown of evergreen leaves and the growing point, although some may be multi-stemmed and more shrub-like. There are a few that are trunkless and prostrate and even some climbers. 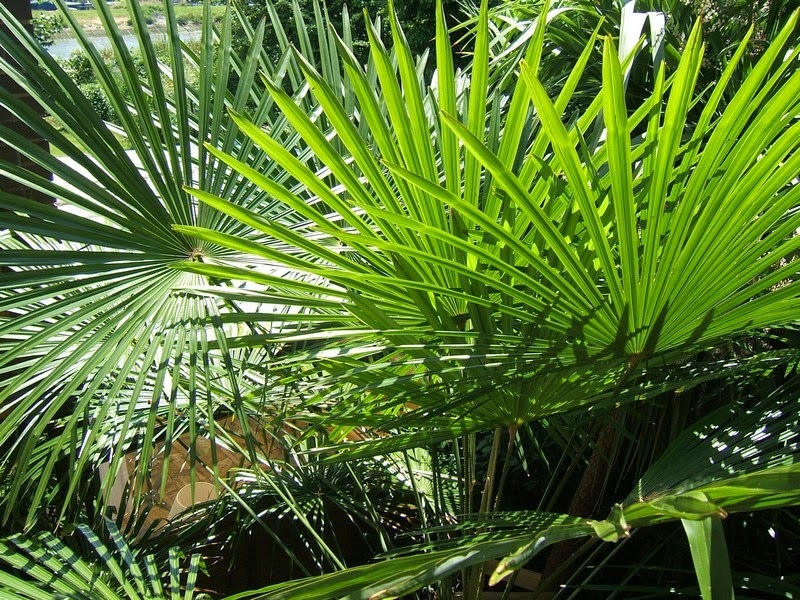 Botanically the leaf shapes are termed palmate, the fan palms and pinnate, the feather palms. 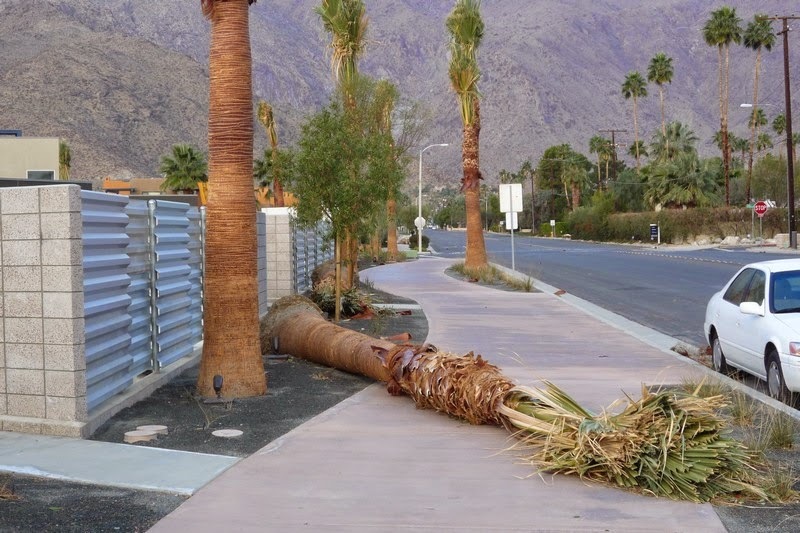 Here in Palm Springs we have two common palm trees, the Mexican fan palm, Washingtonia robusta which is fast growing with a very slender trunk and the native Californian fan Washingtonia filifera, which tend to be thicker and shorter. 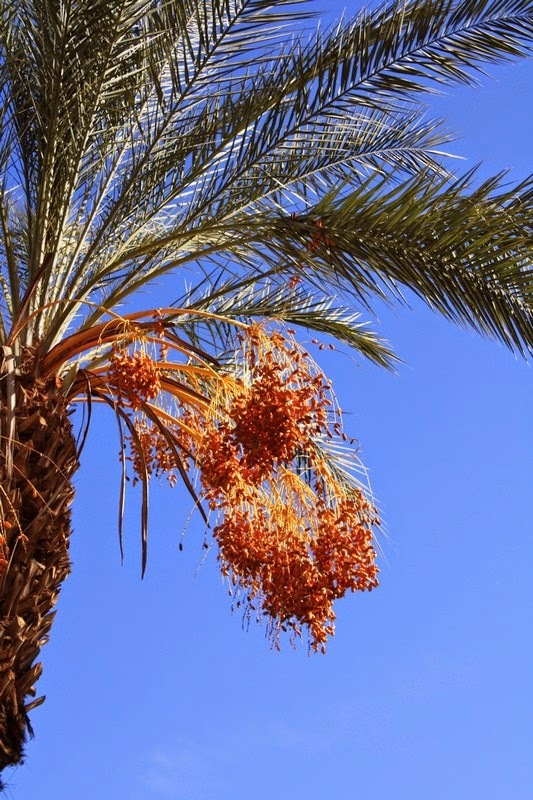 Date palms, Phoenix dactylifera are also grown both as ornamentals and also commercially with the annual date festival held in nearby Indio each February. 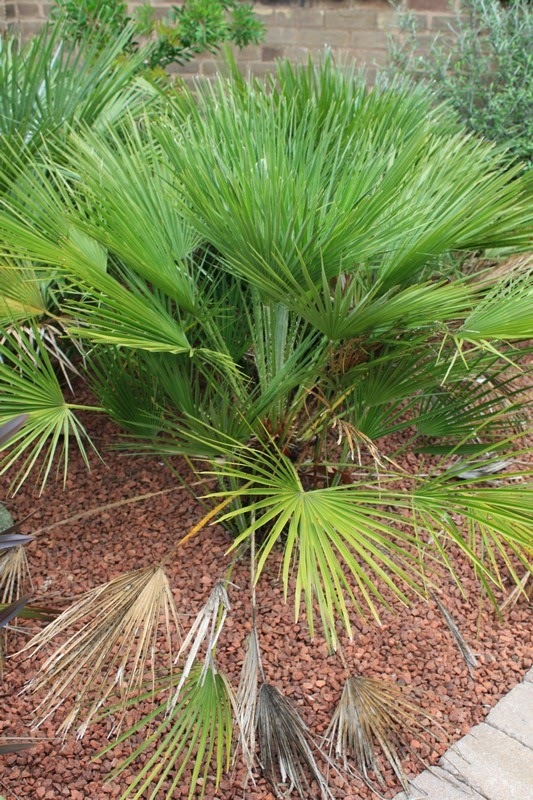 Butia capitata, the jelly palm grows well as does the almost blue leaved Brahea armata, the Mexican blue palm. My own favourite is the dramatic and silver leaved Bismarckia nobilis, originating from Madagascar. 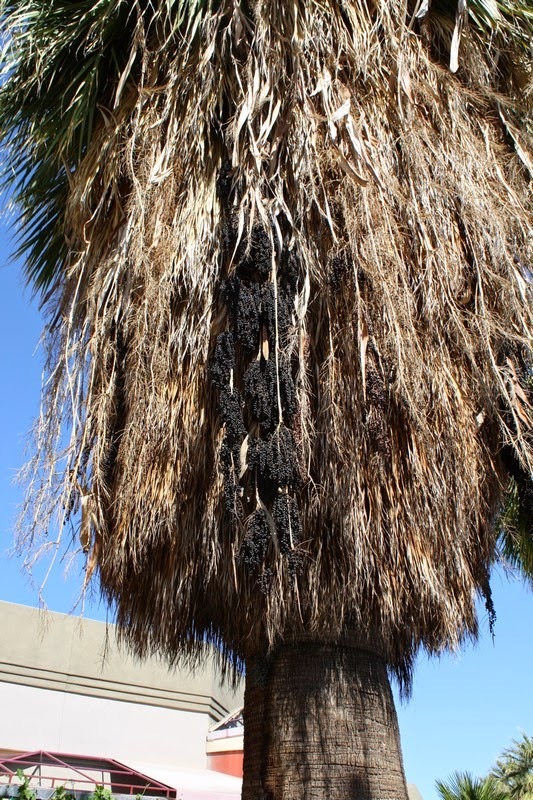 There is also the more delicate looking queen palm with the tongue-tangling name of Arecastrum romanzoffianum. 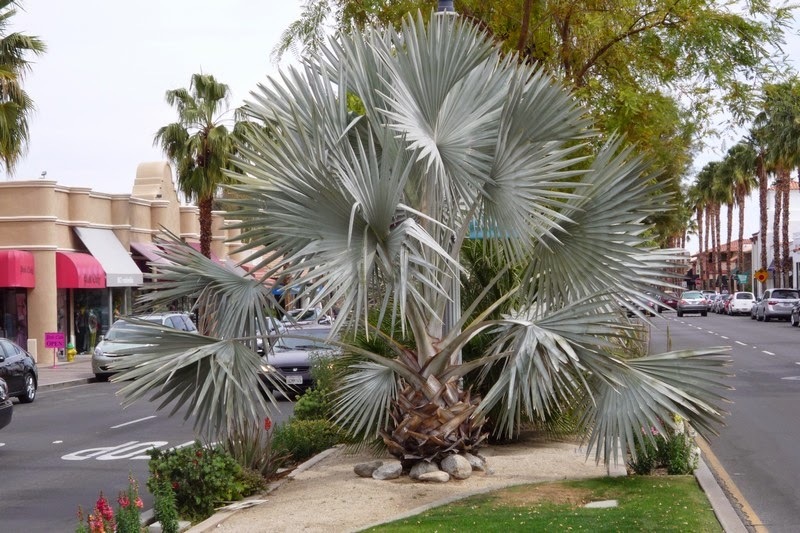 Palm skirt - natural but is it attractive in a cultivated landscape? Also tend to harbour vermin! 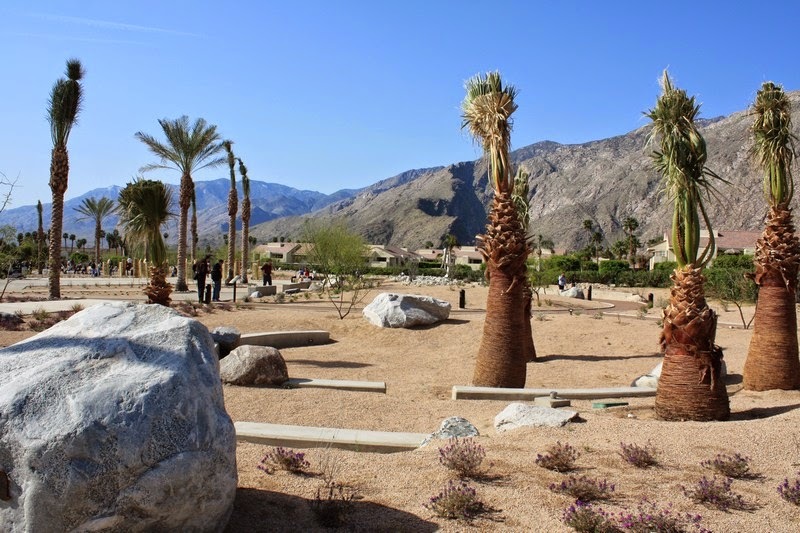 Date palms in a local park - Philip says they look like 'real' palm trees! 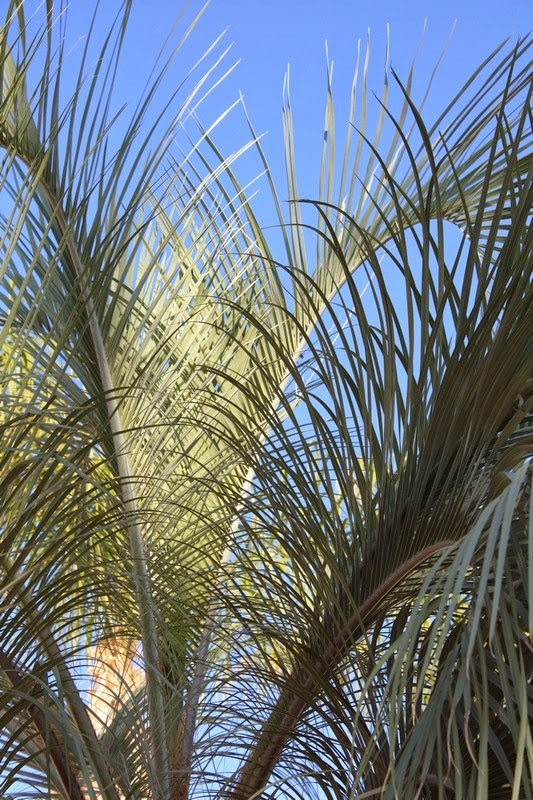 Mature Mexican blue palms - I think! 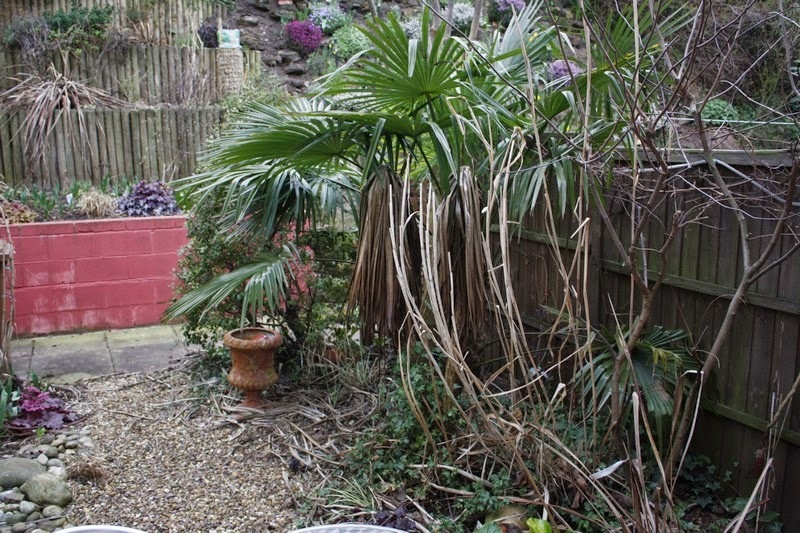 In the UK we have only really one reliably hardy palm and that's Trachycarpus fortunei, the Chusan palm from central China. Around the UK there are many mature specimens of this truly hardy species. My own plant is now about 3m high and came through the tough 2011 winter without a mark. 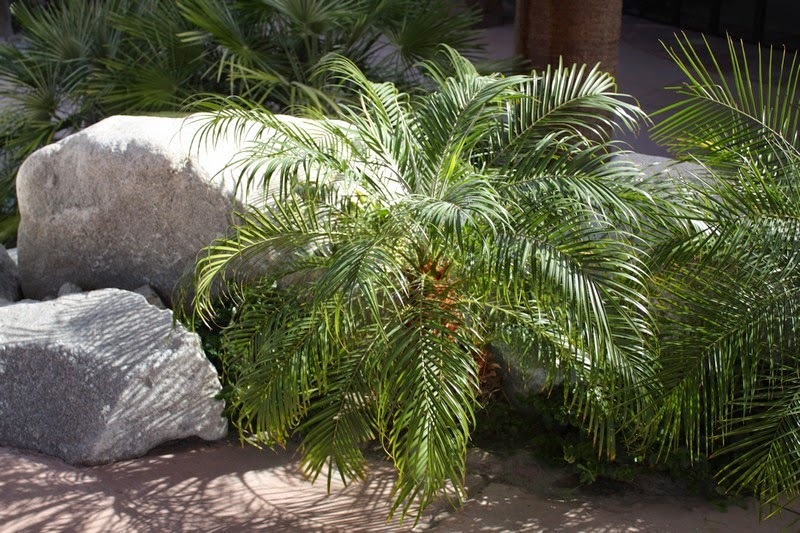 Chamaerops humilis, the Mediterranean dwarf palm is often hardy too in a sheltered location. 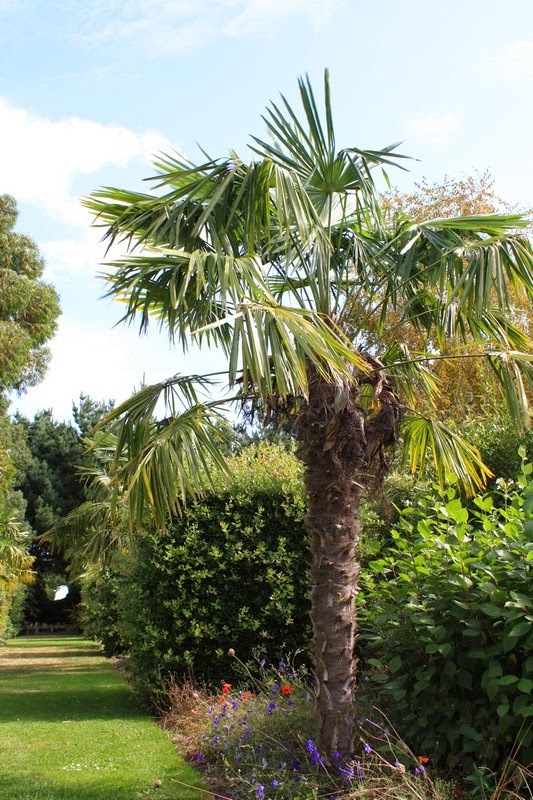 Other gardeners have tried jelly palms and Mexican blue palms and whilst they will sometimes survive mild winters, they tend to struggle and never look really healthy and vigorous. For UK gardeners, it is probably best to grow these borderline species in containers and move to a a greenhouse or tunnel for winter to give a little protection. There are of course many others. 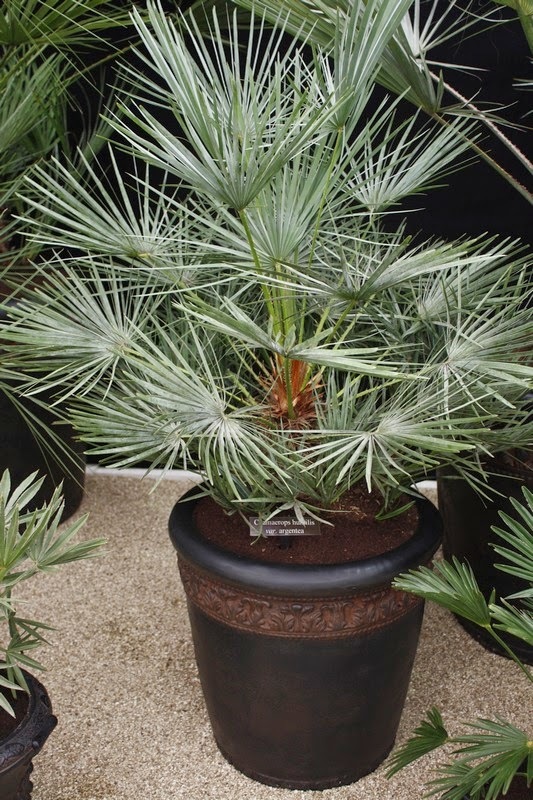 Phoenix roebellenii makes a pretty miniature tree-shaped palm with a single trunk but tends to be slow growing and expensive to buy. It is not hardy. The silver leaved form of Chamaerops sold as 'Argentea' or cerifera has soft grey foliage. 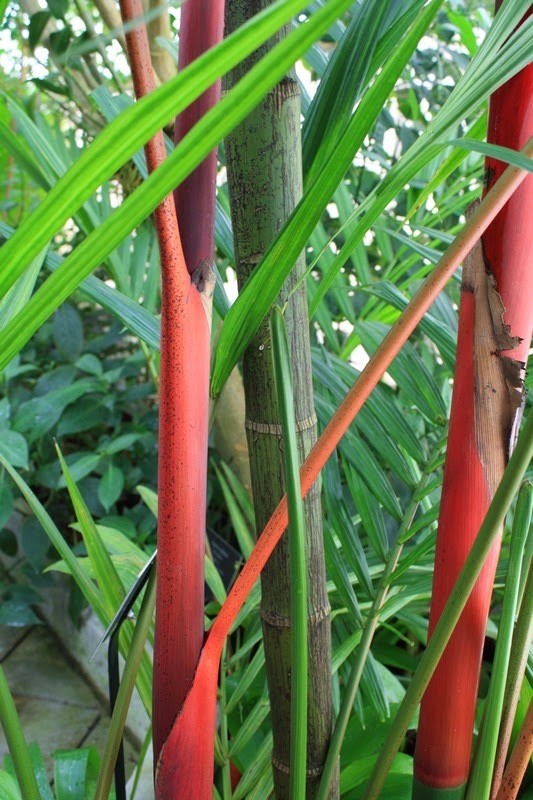 Purely for a warm greenhouse, unless you live in a tropical zone, the striking sealing wax palm Cyrtostachys renda with red stems makes quite a statement. 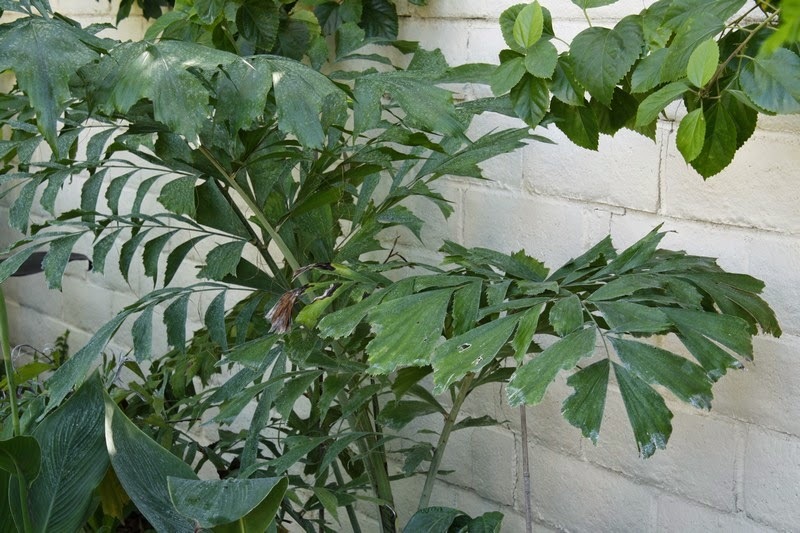 Palms were popular back in the 19C and Victorian parlour palm, Chamaedorea elegans was a familiar house plant along with the typical aspidistra. 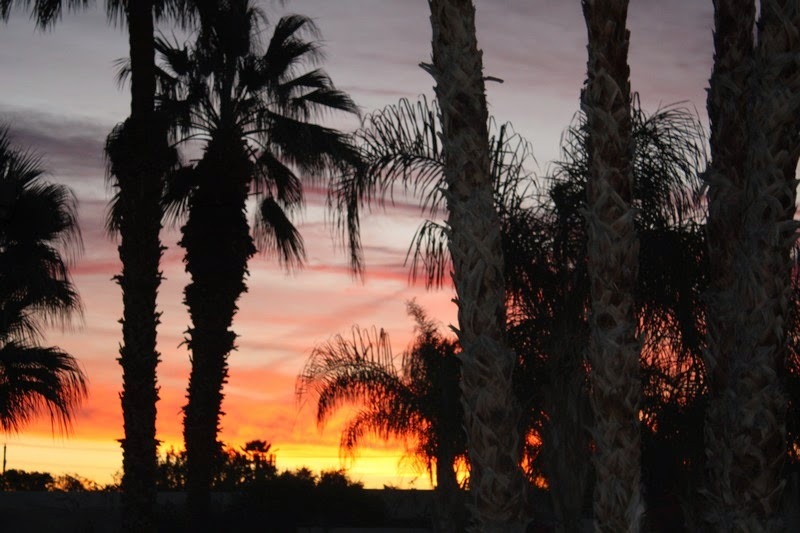 I have to admit I don't know a great deal about growing palms. Amazingly they seem to be transplanted at mature sizes with a very small rootball, although they do tie up the foliage! there is some debate as to whether they should be left to grow naturally with the 'skirt' of dead foliage or trimmed. The process of trimming them involves climbing with leg irons and then wielding a machete with one hand whilst hanging on with the other! Safety? Not a job I would envy! 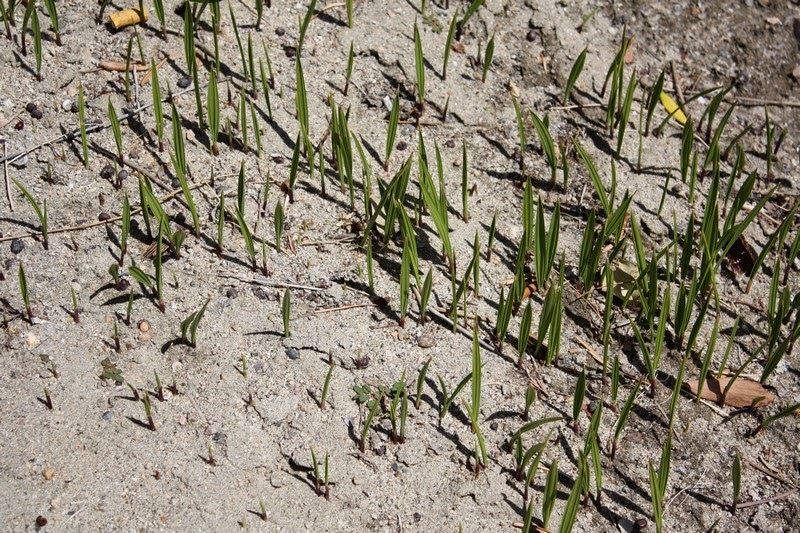 Self-set palm seedlings - weeds? As always having finished this blog entry, I have learned a bit more myself, checking out the pictures and researching my facts. 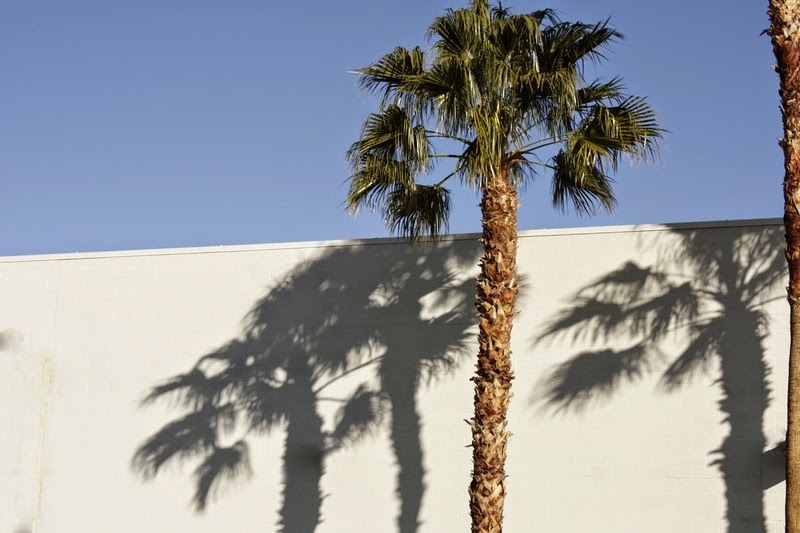 I also didn't realise I had taken quite so many pictures of palms over the years. 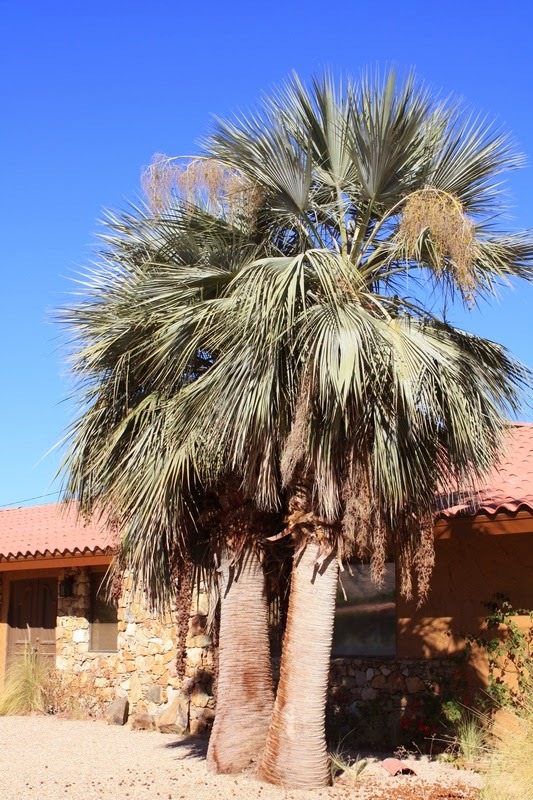 With the exception of a few like Brahea armata a lot do take transplantation and recovery from a very small rootball exceptionally well. 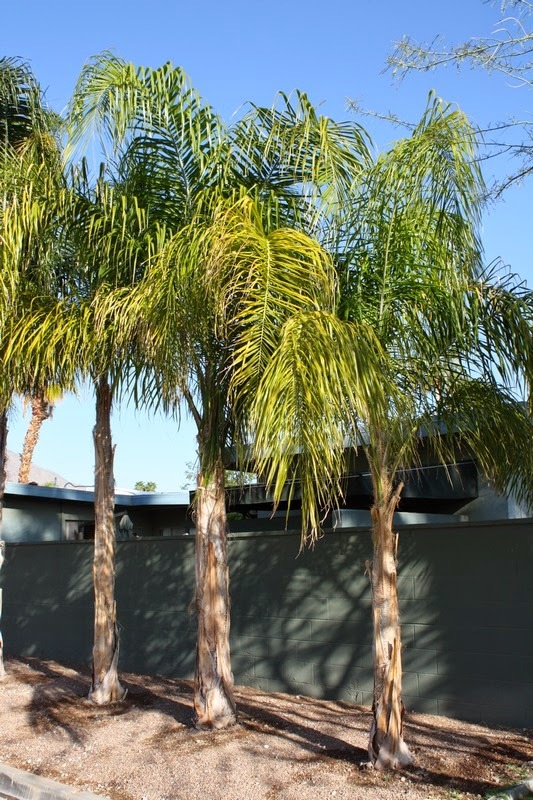 We've had a few palms before that had virtually no roots and they still rerooted successfully with just a bit of TLC and time. 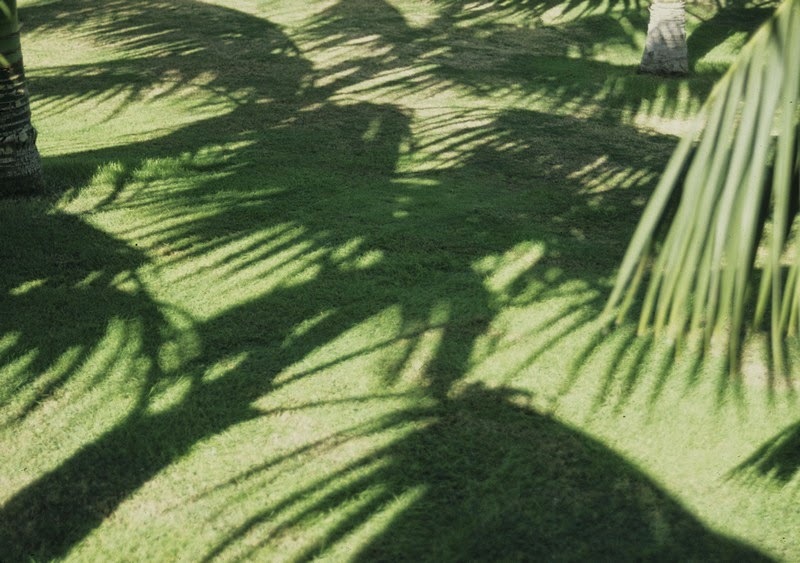 I think the picture labeled Chamaerops humilis - the regular kind, not the silver-leafed kind - is actually a clump of young Trachycarpus fortunei. 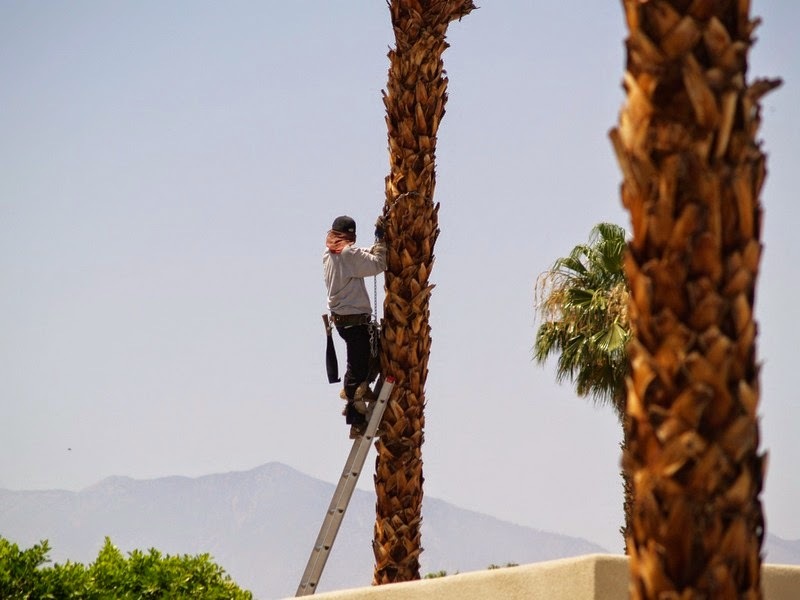 I am not a huge fan of that practice of transplanting fully grown palms...They seem to take quite long to recover, and I would rather see young specimens develop... and presumably that would be much cheaper as well. Thanks for the observation - you may well be right so I have changed the pic. Maybe not such a good specimen but a plant I purchased myself some years ago so hopefully correctly supplied!